While I usually like to favour smaller or independent restaurants, I acknowledge that if you’re trying to be vegan, but maybe a lot of your friends or family aren’t, it can be difficult to find a place for everyone to eat together. More and more chains in the U.K. have now started offering vegan options, and hence are very easy options for a dinner with friends as they are a) easily found around the city and b) they are familiar to the public and might feel a bit less intimidating than taking your pals to a 100% vegan restaurant (although I think you should do that too at some point as there are some very nice ones!). Chain restaurants are usually pretty good for a mixed group of people too as the menus often cater for all sorts of diets from vegan to meat eater, and a lot of them have gluten free options too! This was definitely the biggest surprise for me. I don’t know why, but I really wasn’t expecting Wetherspoon’s to cater for vegans, but, of course, they have now proven me very wrong. There’s not many different options, but enough in my opinion to find something for most tastes. Other vegan options include a sweet potato and chickpea curry and a five bean chilli. The Diner is another place that I’ve absolutely loved ever since I first went over 6 years ago, but as the menu is quite heavy and very old school American, I didn’t think they’d have anything for vegans. A few months ago, though, I went there to celebrate my friends birthday and was very pleasantly surprised: their taco salad can be made into a vegan version – yay! Instead of coming in a normal bowl, the salad is served in a big taco shell (yum!) and has toppings such as guacamole, salsa and falafels drizzled with a tahini dressing. I thought I would be jealous of my friends dirty burgers, but as my food arrived I didn’t experience any kind of food envy at all – it was SO good! Because of all the different toppings the salad was super tasty and filling. In fact, I’ve already had it three times since! Other vegan options include a vegan burger and vegan eggs benedict. Ahh, Bills, how I love thee. 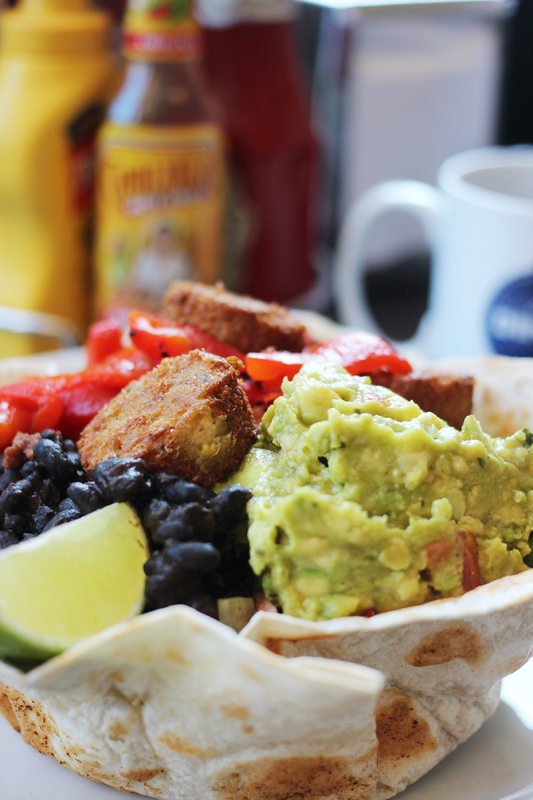 My love affair with Bills began when I first moved to London and fell for their full veggie breakfast (I wasn’t even vegetarian then, but it was just that good!). At that point I was also fully gluten free, and as Bill’s is quite good on the GF department, I went there quite a lot. Bill’s don’t have many vegan options (only one main and a few starters) but as the menu is quite versatile, it’s a good place to go to if you need to book somewhere where you and your friends all have different diets. I had the aubergine, lentil and chickpea curry with warm bread and it was absolutely lovely. 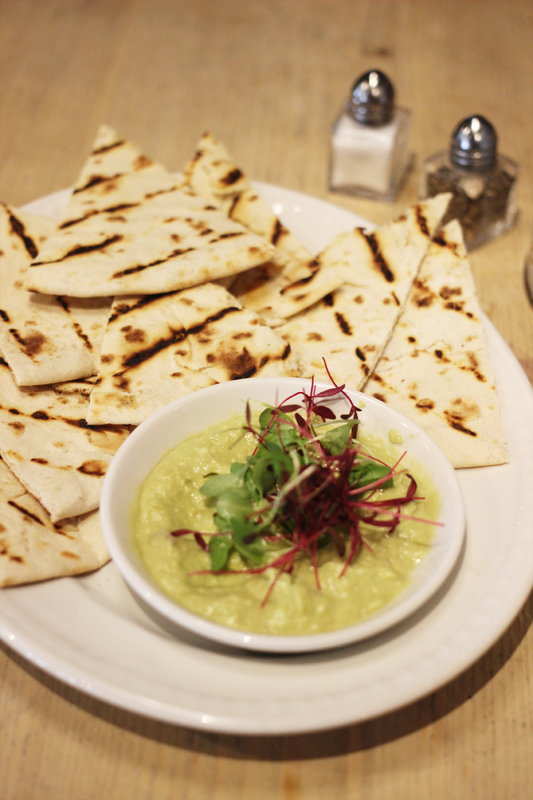 As a side me and my friend shared pitta bread with avocado hummus, which was very good too, although the dip wasn’t nearly enough which might be good to keep in mind. Other vegan options include potato & rosemary bread or olives to share and vegetable crudités as a starter. Pho is the best place to go on a gloomy, rainy day. They serve massive, tasty pho soups (obviously) that have such a yummy broth (perfect if you have a bit of a sore throat!) and that you can fill up with fresh toppings such as bean sprouts and chillies and customise it to your tastes. ALL of Pho’s vegetarian dishes can be made vegan which is amazing – you just need to remember to mention it to your waiter. I had the spicy mushroom pho and spring rolls and really loved everything. Funnily enough I’m not a big fan of mushrooms, but as I knew the broth would be really good I thought I would give them a chance. It didn’t necessarily change my mind about mushrooms, but I had no trouble eating them on this occasion as the overall flavouring was so good. Honestly, I’d just go there for the broth and the fresh toppings! Aside from the soups Pho does a lot of other dishes such as salads and noodles, which might be better suited for the hot summer weather we’ll be getting soon (WE WILL). I’ve always known that Le Pain Quotidien catered well for different allergies and people who preferred organic foods, but for some reason I had never tried or considered their vegan options before. There’s quite a few options from breakfast items to desserts but as I went during lunch time and was very hungry, I decided to try their chilli. It was SO good! The chilli was full of flavour and was served with fresh bread and vegan sour cream which just really topped everything for me.